It's easy to count your blessings at the Thanksgiving table. That exact moment when you look around at your friends and family, dressed in their best, the table set with fine china and crowded with heaping platters of your favorite foods, you know that you are so very lucky. It's so much harder to count your blessings the week after Thanksgiving. That Sunday night, when you (um, me) have six loads of laundry to do, and you have to make lunches for the week (me again), and the baby has eaten yet another two-week old Cheerio from the carpet reminding you it's high time to vacuum (ok, also me), it's a lot harder to take a minute to look around the utter chaos and count your blessings. That's the funny thing about blessings. They don't often announce themselves with a neon sign or with a giant blinking arrow overhead pointing, "Blessing here." And so instead, I crankily tweet about the nuttiness I encounter on public transit on my morning commute. I sigh about how we eat more than our fair share of frozen pizza (we're partial to Red Baron, in case you're curious). I complain about little man's changing sleep patterns which often lead to him waking me up for playtime at 4 a.m. And I grumble about how my baby hair is back with a vengeance. And so this past Sunday, after the happy pandemonium of many, many loved ones gathering for Thanksgiving, eating many a decadent meal, and chattering way too much, I found some time to bake in silence and truly reflect on the many blessings in my life. 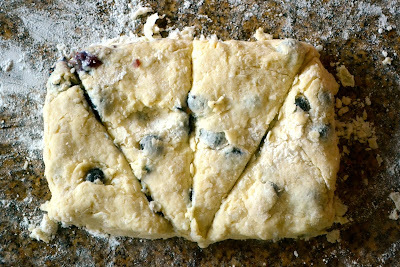 And as I measured the flour and sugar for these Blueberry Toasted Almond Scones, I forced myself to admit that enduring the nutters on public transit was a small (and entertaining!) price to pay to commute to a job I loved. Blessing! Little man's grin was still awesome, even at 4 a.m. (but little man, if you're reading this, I'm sure your grin is doubly awesome, say at a more reasonable 6 a.m.). Blessing! And as I cut in the butter, I was forced to admit that I am blessed that my poofy, out of control hair (complete with mocking baby hairs) has made a triumphant comeback after I lost handfuls of it everyday post-baby and was convinced I would soon be bald. I toasted the almonds and mixed them into the dough, along with a few drops of fragrant almond extract. After years of having to carry my laundry to a common washing room, and having to run back up three flights of stairs at least three times because I forgot the detergent, softener, and/or quarters, I am blessed that we now have a washer and dryer in our house. I carefully added the blueberries and gently dumped the dough on the floured counter. So so blessed to finally have a kitchen with more than 1/2 a counter. 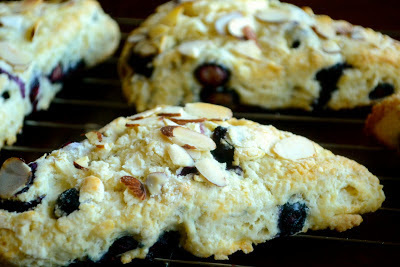 And so, I baked these scones, bursting with juicy blueberries and toasted almonds. And as I watched my family eat the entire batch in one sitting, I recognized that perhaps the biggest blessing of all was that Red Baron makes a mean frozen pizza! Preheat oven to 400 degrees. Toast almonds on a hot, dry pan on the stove until lightly golden and crunchy. Sift flour, baking powder, salt, and sugar. Cut in the butter with the pastry blender. Mix in blueberries and 1/4 cup of toasted almonds. In a separate bowl, beat heavy cream, egg, and almond extract. Slowly pour wet ingredients into dry ingredients. Gently knead 4-5 times until mixture comes together. Divide dough in two halves. On a floured counter, roll each half into a rectangle (approximately 6 inches by 3 inches). Cut in half vertically, and then cut the two resulting squares diagonally so you have 4 triangular wedges. Repeat with other half of dough. Place wedges on a cookie sheet lined with parchment paper or Silpat (Silpats are totally a blessing!). Brush wedges with cream and top with remaining 1/4 cup of toasted almonds. Bake for 15-20 minutes. 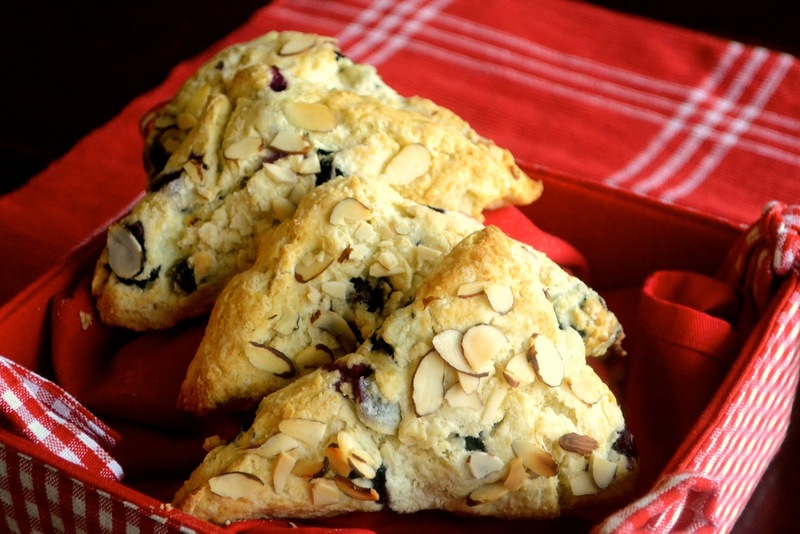 Eat quickly while warm because blessings like freshly-baked scones don't stick around! Yields about 8 good-sized scones. I love this post. The mood. The voice. The pacing. Be extra thankful for those small blessings like decent frozen pizza. I totally forgot about the hair falling out in clumps things. You have many blessings including the ability to make a mean scone. Maybe you should start taking photos of the nutters (for reference reasons of course). Glad you had a great Thanksgiving. Hair falling out in clumps? I guess I'm counting the blessing of adoption right now. And bless you for posting scones, especially scones lacking in chocolate. I love blueberries, and almonds. Bahaha, I could've written a lot of this post myself - we have a lot of the same blessings, including frozen pizza (although we're partial to Trader Joe's brand). =) And these scones look just wonderful - wish I could have one for dessert tonight or breakfast tomorrow! I am going through that- I am surely going to turn bald by the time the baby turns one phase. Its like my hair is celebrating "fall" all year round. You are just the nicest person ever. I really mean that. I could learn a whole lot from you on how to be grateful and count my blessings. I do NOT excel in that! Maybe you can give me some tips (along with some scones) the next time I come up to SF? I'm hoping it's soon!! PS: Have you tried Seabuckthorn for your hair? It takes a while but it works. I speak from experience here! I have so much to be thankful for! And I am thankful for that. Even when I don't feel like going to work, I remind myself how lucky I am to have a career that I love! I love the combination of blueberries and almonds--absolutely my favorite! I still remember the days when my children were really small. I never even thought of blogging back then, and there was no such time. And I didn't even bake delicious scones like these (okay and I still don't bake often). :) Scones are my favorite, and I love them more than cupcakes and cookies. :) These look wonderful!! Love. Just love. Why don't you live closer to me? Seriously. We need to resolve this. What a wonderful post, and thank you for visiting my blog! Those scones look delicious! Amazing photo. You're so right -- when the ponytails are causing me to pull out my (grey) hair over a knock-down fight over who should get the pink (not yellow) bowl of ice cream and my husband is repeating over and over that it is time to get upstairs for bath time -- I don't feel very grateful. But . . . I wouldn't trade it and I feel very blessed on those rare times when I have a quiet moment (okay very rare). Love your post and your blog. Thanks for dropping by mine and saying hi. P.S. Could you add the option to subscribe by email to your new posts? Your scones look wonderful. And you're right - it's always a great idea to remember the little blessings that are sometimes easy to overlook. Btw.. your scones look mouthwatering, I LOVE that you only used 4 tbsp of butter, I"ve seen ridiculous amounts. Excellent job. Bookmarking it! Hi Honey! Thanks for dropping by. I'd love to know how your scones turned out! If you cut the scones as described above (i.e., in 2 rectangles), it yields about 8 good-sized scones. I've also used the same recipe, divided the dough in half, made two circles, and cut the circles into 6 to yield 12 dessert-sized scones. Love these scones! Blueberry is one of my favorites, so I'm definitely bookmarking these. This is a real treat! Would love to eat one right now as I am sipping on my tea. I love that you found how blessed you are in every day life! we often forget little blessings in our life while we juggle between work, hair issues and daily commute.